“I feel the need—the need for speed!” (Peter “Maverick” Mitchell, Top Gun). Speed control that is! Whether it’s jets or a turntable’s speed… it all matters. We’ve all heard the chipmunk like squeals of a 33 1/3 rpm LP mistakenly played at 45 rpm, or the unholy dirge of a 45 played at 33 1/3. Both of these examples provide clear evidence that your turntable’s motor speed plays a pivotal role in what you’re hearing when you spin a record. While the delta between 33 1/3 vs 45 rpm is large, small drifts in platter speed on the plus or minus side of 33 1/3 or 45 rpm also matter a great deal. 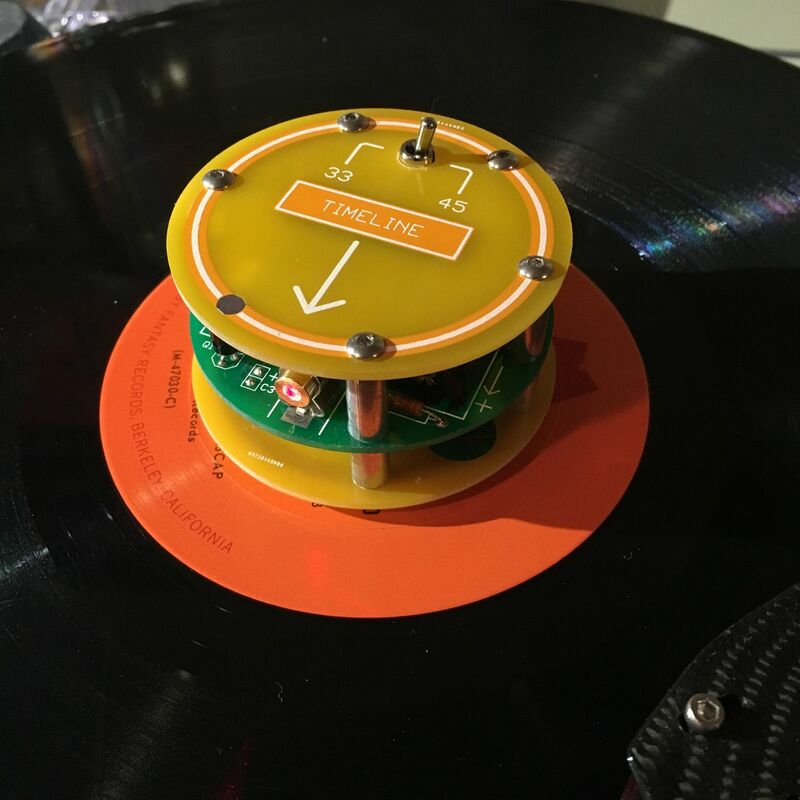 When it comes to an analog front end using vinyl as the source, without accurate turntable speed it doesn’t matter how amazing your cartridge, phono preamp, or cables are, you’re not hearing what you should be. Accurate speed is the beginning of the signal chain, faithful reproduction of recorded music starts there. This is why many direct drive turntables include speed adjustment mechanisms such as an etched platter, speed monitoring light, and knob that can be used to increase or decrease the platter’s speed. With belt drive turntables the quest for accurate platter speed is often addressed with outboard speed controllers that can be used in conjunction with a printed platter mat and stroboscopic light to assess and adjust speed. The Goldilocks principle applies here, your turntable speed needs to be “just right.” If the platter is spinning either too quickly or too slowly, even a small amount, you’ll have a shift in pitch which negatively affects playback. If you’re an audiophile like me, this matters. Chances are you care a great deal about faithfully reproducing the most accurate sound possible, and have invested mightily to do so. Without accurate speed you’re not hearing what the artist and mastering engineer intended with respect to pitch, rhythm, and pace, it’s that simple. While using old school stroboscopic tools to measure motor speed via the turntable’s platter is certainly a good start and better than nothing, it is far from an exact science. Assuring truly accurate speed, and conversely accurate reproduction of music, requires a more modern approach, one that utilizes 21st century technology. 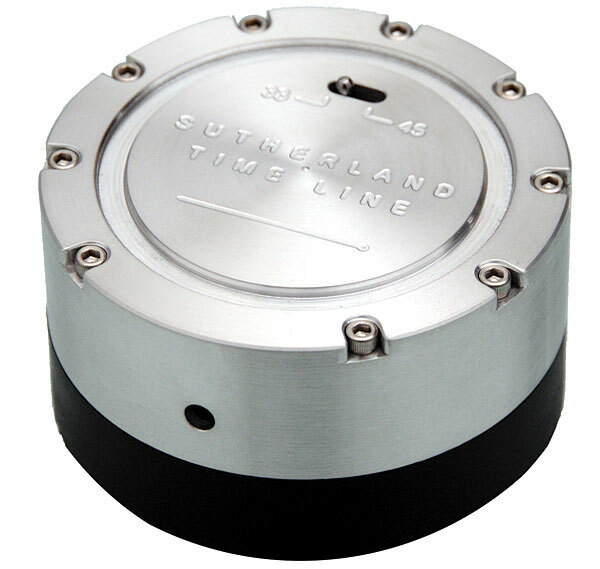 To that end, Sutherland Engineering introduced Timeline, a laser based stroboscopic puck used to measure turntable speed with pinpoint accuracy. Designed to be placed on your turntable’s platter, with a record and tone arm in place, the Timeline’s laser projects a continuous sequence of red flashes around your room at precisely 8 times per revolution at the selected 33 1/3 (or 45) speed, each set via a toggle switch located on top. With a time-base accuracy of 2 parts per million you’d be hard pressed to find a more accurate device for measuring your motor’s speed. The original Timeline has been discontinued due to the complexity and expense of fabricating its aluminum and delrin housing, and the $400 price tag which resulted. I snapped up one of the last original units, so clearly even at that price point I believe in the value of accurate speed. Happily Ron Sutherland has passed the baton to friend and colleague Chad LaFever who’s released the Timeline SE, a considerably less expensive, “lite” version, containing the same technology and accuracy of the original Timeline, only now available in a pared down, simplified, smaller housing and offered for just $150, nearly a third of the original’s price. Obtaining the ultimate in accurate speed is now more affordable than ever with the new Timeline SE. In fact, the Timeline is so accurate that when I received the original model Ron Sutherland warned me that this much accuracy could be a double edge sword, driving those with OCD leanings a little nuts. Happily I haven’t lost my mind just yet. Though I’m sure some will feel compelled to use their Timeline SE before every record, I try not to obsess, choosing instead to measure and adjust my motor speed no more than once a month. The measuring process is simple enough. Once the Timeline SE is situated on top of your turntable/record you select the speed you’d like to measure using the Timeline SE’s speed toggle switch which also activates the unit’s laser strobe light. Next place you your stylus onto the record’s surface. Ideally you’ll want to project the Timeline SE’s laser beam onto a flat surface across the room, the further away this surface is the more accurate the results. Choose one of the 8 projected laser segments that’s easy to see and use that as your guideline. Make a pencil mark, or use a piece of tape on the wall to serve as a second fixed guideline. When both guidelines are consistently aligned, your speed is accurate. If your turntable is rotating at exactly the correct speed, the line segment will be projected at the same place during every revolution, and line up perfectly with your pencil mark or piece of tape. If however your turntable is too fast, the projected line segment will drift in a clockwise direction from your mark. If too slow, it will drift in a counter-clockwise direction. Simply adjust your turntable’s speed accordingly to match the laser’s guideline with the fixed guideline mark you made on the wall. The Timeline will also reveal any loading effects of stylus dragging forces. This device is extremely sensitive, so move slowly and deliberately when making speed adjustments, small moves produce bigger than expected results. If sonic attributes such as pitch, rhythm, pace, tone, and dynamics are important to you, and you can adjust the speed of your turntable, in this reviewer’s opinion, the Timeline SE is an essential piece of kit. I had no idea how much my turntable’s motor speed had drifted, or if it was ever accurate in the first place until I actually measured it. The aural improvements that accurate speed can make are far from subtle and the Timeline, now Timeline SE, has proven itself over and over again to be a very valuable tool. If your current turntable doesn’t permit speed adjustments, you may want to consider an upgrade… and then buy a Timeline SE.